The Edon TS515 has proven to be a brilliant craft for instruction of novices (students and adults alike). 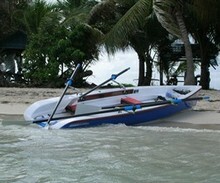 Recreational rowers have also embraced the scull because of its stability and convenience. With a very stable hull design and the addition of the purpose built stabilisers the TS515 is nearly impossible to tip, which greatly enhances the rate of learning for novices. The patented quick-release rigger system means the scull can be rigged or de-rigged in seconds which allows three of these sculls to be stored on one rack. Each boat is individually manufactured to customer order , so after ordering no cancellation is possible . Schnelles, leichtes und kippstabiles "Einer" Sportruderboot aus GFK geeignet als Wanderruderboot oder zum Fitnessrudern mit Wing Rollausleger. Schnelles ,kippstabiles und selbstlenzendes Sportruderboot aus Polyethylene als Wanderruderboot oder zum Fitnessrudern mit Rollsitz für 1 bis 2 Ruderer.